Crane Buildings: The building crane is a complex structural system consisting of the crane with trolley and hoist, crane rails, and crane runway beams, structural supports, stops and bumpers. Note: We specialize in crane buildings and have furnished the largest crane systems in the industry. 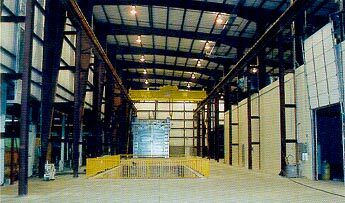 We routinely handle 100 ton crane buildings and more.